Is there anything better than chocolate and raspberry together? I dare say there is, and it's called Dark Chocolate Frosting. I've never had a go-to chocolate frosting before now, but I guarantee I'll never be making another recipe again. To make the base for these cupcakes, I used an old stand-by, the classic One-Bowl Chocolate Cupcake recipe, and filled them with a generous dollop of raspberry jam (you can find my favorite filling technique here). I made the frosting ahead of time and refrigerated it until a few hours before I was ready to use it. It took some panic and quite a bit of coaxing to get it into a spreadable/pipe-able state, it was pretty stubborn about staying solid even after back at room temperature. If this happens to you, just microwave on high at 5 second intervals until it starts to soften but not melt. The texture of this frosting is the most beautiful I've ever seen. It's rich and silky, and pipes beautifully. 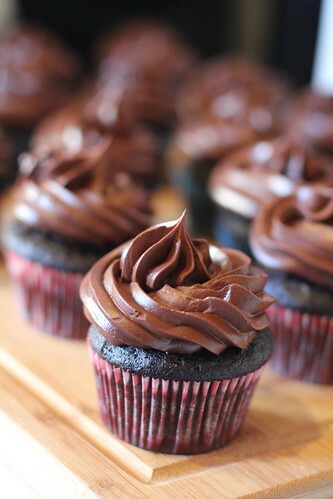 I promise this is the only chocolate frosting recipe you'll ever need. 1. Combine cocoa and boiling water, stirring until cocoa has dissolved. 2. With an electric mixer on medium-high speed, beat butter, confectioners' sugar, and salt until pale and fluffy. Reduce speed to low. Add melted and cooled chocolate, beating until combined and scraping down the bowl as needed. 3. Beat in the cocoa mixture. 4. If not using immediately, frosting can be refrigerated for up to 5 days, or frozen up to 1 month, in an airtight container. Before using, bring to room temperature and beat on low speed until smooth again.